The site of Trafalgar Square had been a significant landmark since the 13th century and originally contained the King's Mews. After George IV moved the mews to Buckingham Palace, the area was redeveloped by John Nash but progress was slow after his death and the square did not open until 1844. The 169-foot (52 m) Nelson's Column at its centre is guarded by four lion statues. A number of commemorative statues and sculptures occupy the square but the Fourth Plinth, left empty since 1840, has been host to contemporary art since 1999. The square has been used for community gatherings and political demonstrations including Bloody Sunday, the first Aldermaston March, anti-war protests, and campaigns against climate change. A Christmas tree has been donated to the square by Norway since 1947 and is erected for twelve days before and after Christmas Day. The square is a centre of annual celebrations on New Year's Eve. It was well known for its feral pigeons until their removal in the early 21st century. 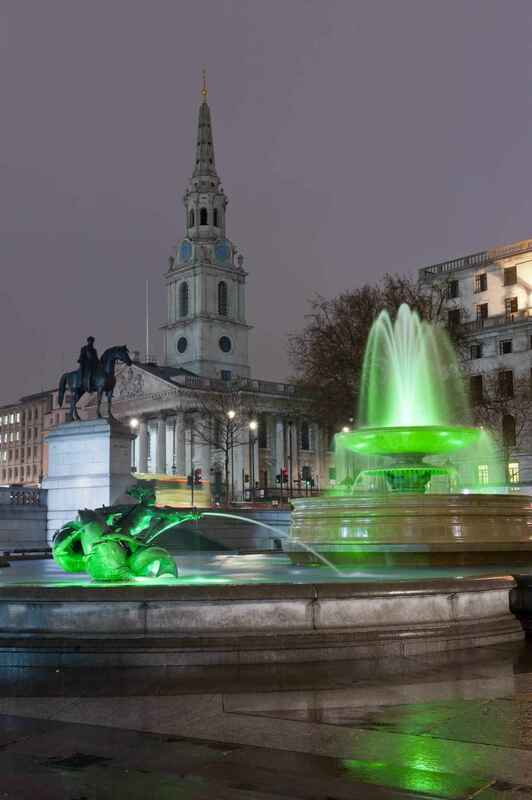 Surrounding the square are the National Gallery on the north side and St Martin-in-the-Fields Church to the east. To the south west is The Mall leading towards Buckingham Palace via Admiralty Arch, while Whitehall is to the south and the Strand to the east. Charing Cross Road passes between the National Gallery and the church. London Underground's Charing Cross tube station on the Northern and Bakerloo lines has an exit in the square. 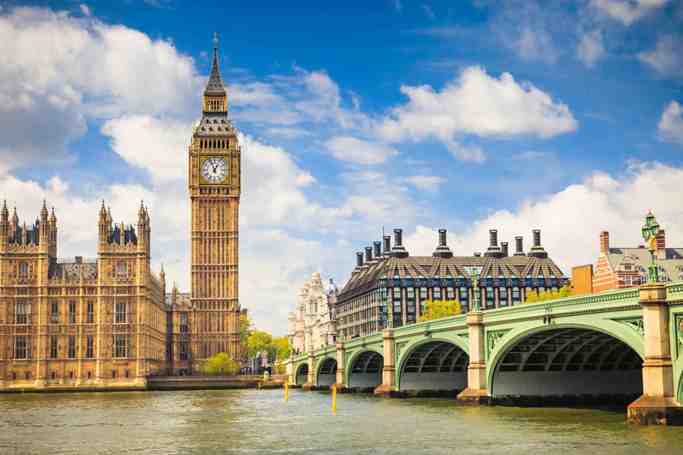 The lines had separate stations, of which the Bakerloo line one was called Trafalgar Square until they were linked and renamed in 1979 as part of the construction of the Jubilee line, which was rerouted to Westminster tube station in 1999. Other nearby tube stations are Embankment connecting the District, Circle, Northern and Bakerloo lines, and Leicester Square on the Northern and Piccadilly lines. London bus routes 3, 6, 9, 11, 12, 13, 15, 23, 24, 29, 53, 87, 88, 91, 139, 159, 176, 453 pass through Trafalgar Square. Nelson's Column was planned independently of Barry's work. In 1838 a Nelson Memorial Committee had approached the government proposing that a monument to the victor of Trafalgar, funded by public subscription, should be erected in the square. A competition was held and won by the architect William Railton, who proposed a 218 feet 3 inches (66.52 m) Corinthinan column topped by a statue of Nelson and guarded by four sculpted lions. The design was approved, but received widespread objections from the public. Construction went ahead beginning in 1840 but with the height reduced to 145 feet 3 inches (44.27 m). The column was completed and the statue raised in November 1843. The last of the bronze reliefs on the column's pedestals was not completed until May 1854, and the four lions, although part of the original design, were only added in 1867. Landseer, the sculptor, had asked for a lion that had died at the London Zoo to be brought to his studio. He took so long to complete sketches that its corpse began to decompose and some parts had to be improvised. The statues have paws that resemble cats more than lions. There are three busts of admirals against the north wall of the square. Those of Lord Jellicoe by Sir Charles Wheeler and Lord Beatty, by William MacMillan were installed in 1948 in conjunction with the square's fountains, which also commemorate them. The third, of the Second World War First Sea Lord Admiral Cunningham by Franta Belsky was unveiled alongside them on 2 April 1967. On the south side on the site of the original Charing Cross, is a bronze equestrian statue of Charles I by Hubert Le Sueur. It was cast in 1633, and placed in its present position in 1678. The two statues on the lawn in front of the National Gallery are the statue of James II by Grinling Gibbons to the west of the portico, and of one George Washington, a replica of a work by Jean-Antoine Houdon, to the east that was a gift from the Commonwealth of Virginia installed in 1921. Two statues erected in the 19th century have since been removed. One of Edward Jenner, pioneer of the smallpox vaccine, was set up in the south-west corner of the square in 1858, next to that of Napier. Sculpted by William Calder Marshall, it showed Jenner sitting in a chair in a relaxed pose, and was inaugurated at a ceremony presided over by Prince Albert. It was moved to Kensington Gardens in 1862. The other, of General Charles George Gordon by Hamo Thornycroft, was erected on an 18-foot high pedestal between the fountains in 1888. It was removed in 1943 and re-sited on the Victoria Embankment ten years later. 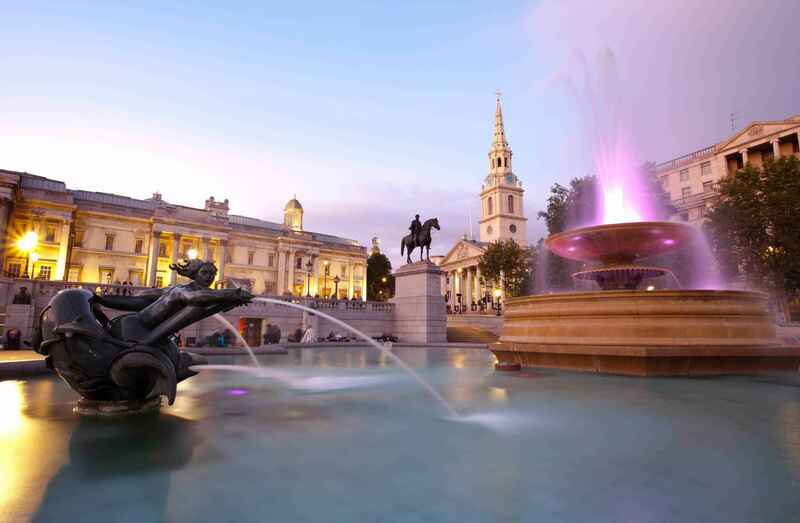 Trafalgar Square | eTips Inc.